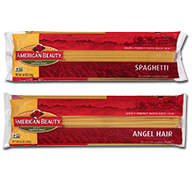 "Capelli d'angelo" is Italian for "angel hair", thinnest of all pasta strands. Because it is so thin, it cooks in only 2 minutes! Angel Hair is great for light entrées, side dishes or broken and cooked in soups. This delicate pasta works best with very thin tomato-based or broth-based sauces or simple olive oil tosses. Use finely chopped vegetables, seafood or chicken in angel hair tosses to match the delicacy of this shape. Available in 16 and 24 oz.